The bunker arrived at Bridgnorth just before the Spring Gala and prompted many comments of admiration from visitors to the three day event. We are extremely grateful to the fabrication team at Boston Lodge Works for an excellent job and also to SVR drivers and painters Andy Williams and Gary Townley who produced a lovely finish to the construction before it left Wales. A new smokebox door arrived on site also just prior to the Gala. The front ring against which the door closes is expected shortly. Enquiries are under way for the rolling to shape of the smokebox wrapper and pattern making for the chimney. 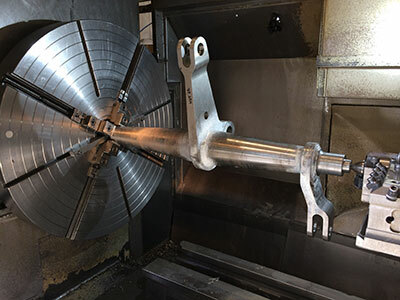 The brake shaft manufactured in Manchester is expected on site in the near future. The cylinders sitting on pallets were temporarily positioned by the chassis for the Gala and it is hoped to mount them on the chassis in the near future. Axlebox work continues and the two cast feet which support the bottom of the firebox on the stretcher in the chassis have been machined. A meeting has taken place to discuss the start of work on the construction of the boiler. 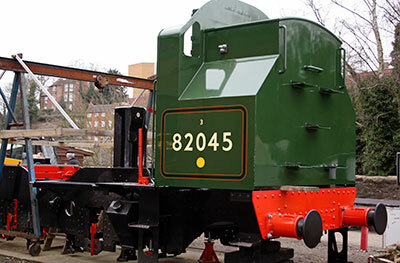 The boiler appeal was approaching £170,000 at the time of writing (28th March), bringing the prospect of achieving our target of £200,000 by the end of the year ever closer. We might even exceed it, so keep your fingers crossed! 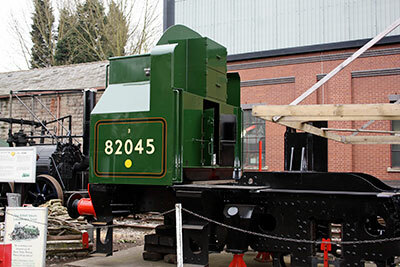 As Tony reports in his Engineering notes, a productive meeting was held on 23rd March with the SVR's Boiler Shop Manager, Duncan Ballard, at which the boiler build was discussed. A letter of intent has been prepared and will be delivered to Duncan by the end of the month, and it is hoped that construction will commence in the next few weeks. We are absolutely delighted with the response to requests for sponsorship of individual items. Since the last updates, we have received a cheque for £5,000 to sponsor the pattern for the superheater header, an offer from the same gentleman to sponsor that for the chimney, plus no less than three offers for the smokebox wrapper. All these generous supporters have asked to remain anonymous - but thank you all, gents. Items will continue to be featured as and when they come up for sponsorship, so please watch this space. Hard to believe that this is nearly upon us - it seemed an impossibly long way away when we first notified the date last September. We hope to see a good turn-out on Saturday 11th April at 2.00 p.m., venue the Lecture Theatre at Kidderminster Railway Museum. The date was fixed before we knew it fell during the SVR's Members' and Shareholders' Weekend, but hopefully that will not affect attendance too much: it should all be over by 3.30, plenty of time to hop on the next train to Bridgnorth! The Bunker sitting on 82045's chassis. Photos: Tony Massau. 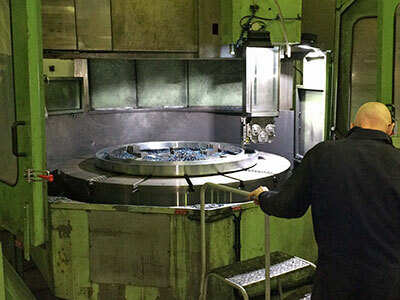 The brake shaft being machined at Stephenson Engineering. Photo: Robert Stephenson.